Pacółtowo Palace is a 200 year-old boutique palace-hotel, picturesquely situated at the foot of the Dylew Hills, surrounded by thousands of acres of hilly meadows. The enchanting closeness of nature, the magnificent architecture and almost unlimited possibilities of spending free time. Excellent for hiking, cross-country skiing, cycling and horse-riding. An important part of the palace and park complex is the Equestrian Complex, with its beautiful stables and unique"Ebbe und Flut" training squares. Our equestrian centre offers both horse-riding and 50 km cross-country treks. With two swimming pools, a Turkish bath, beauty treatments and aesthetic medicine. Particularly popular are Ayurvedic massage and yoga classes run by masters from India. 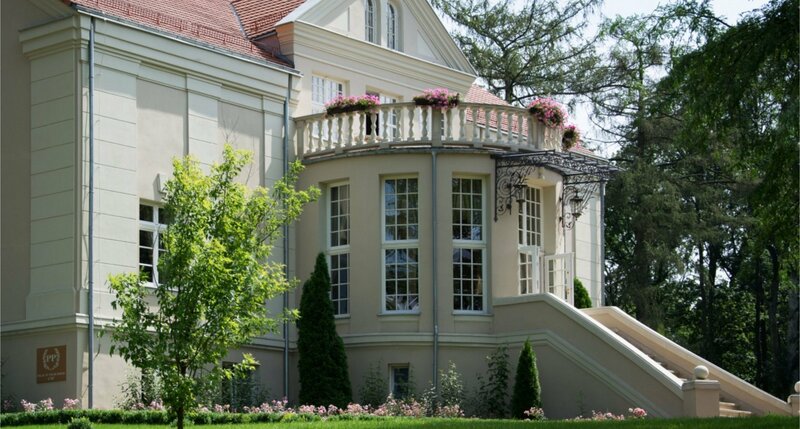 Pacółtowo Palace is a lifestyle experience, ideal for those who expect the highest in quality, prestige and luxury in a truly unique atmosphere. W 2016 roku restauracja w Pałacu Pacółtowo została wyróżniona w Gault & Millau. Jest to jeden z najbardziej cenionych przewodników kulinarnych na świecie. Restauracja specjalizuje się w serwowaniu dań Slow Food. Wszystkie produkty pochodzą z własnej hodowli i są objęte certyfikatami ekologicznym. The carefully arranged, palatial interior exudes comfort and convenience. Unique details accentuate the historic character of the interior. Pacółtowo Palace is unique in that everyone finds something for themselves. You can relax just the way you like - in the breathtaking natural surroundings of the Dylew Hills. You will be delighted by the stylish arrangements and elaborate accents of our spacious rooms. Well-equipped conference rooms comfortably host training sessions, business conferences and high-level offsite meetings. For art and culture lovers, we offer world class Chopin Recitals, painting exhibitions and summer outdoor concerts.